Bruno Mars is denying a report claiming that he was tapped to play Prince in an upcoming biopic about the late music legend. A representative for Mars told Billboard that the report from British tabloid The Daily Mirror is "100 percent false," adding that the story is not true. Despite the Mirror story saying Mars was "being lined up to play Prince" in a Netflix biopic, the streaming service told Billboard that there is no such film in development. Mirror's online deputy digital editor said in an email to The Associated Press that the publication was reaching out to the reporter on the story to see if it needed to be corrected or clarified, and checking with Netflix and Mars for an official statement. 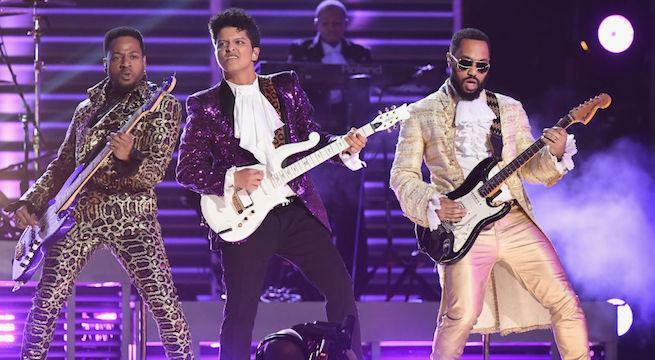 Mars performed an incredible tribute to Prince at the 2017 Grammy Awards when he sang "Let's Go Crazy," almost a year after Prince's death in April 2016. Prince was 57 when he died from taking counterfeit Vicodin that was laced with fentanyl. No criminal charges were filed in the case, although a doctor accused of illegally prescribing an opioid painkiller to the musician a week before he died agreed to pay $30,000 in a federal civil violation. Dr. Michael Schulenberg of Minneapolis agreed to the settlement right before prosecutors announced in April that they wouldn't be filing any criminal charges following the two-year investigation. His attorney maintained that he did not have a role in Prince's death. Prince was found unresponsive in an elevator at his Paisley Park estate on April 21, 2016. An autopsy found he died of an accidental fentanyl overdose. Meanwhile, Mars remains on the road for his 24K Magic World Tour with Ciara as his opener — a change from his initial plans, which involved Cardi B, who backed out after having her and husband Offset's first child earlier this year. "Most important thing is you and your family's health. I know the fans will understand. You are absolutely doing the right thing," Mars wrote to Cardi B after she announced she wouldn't be attending the tour. "I also know we'll share the stage with the time is right. We love you Cardi and we will play Bodak Yellow every night in your honor," he continued. "Please give your baby girl a hug from me and a hug on behalf of everyone on the 24K magic Tour."